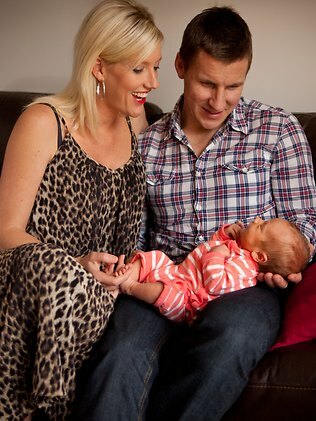 Breakfast radio host Jodie Oddy, and her husband Greg Oddy, welcomed their daughter Payton on Tuesday August 30, weighing 3.27 kg. Payton joins big sister Taylor, aged 10, from Jodie’s first marriage to cricketer Greg Blewett. Jodie does breakfast radio for Mix 102.3 in Adelaide, and Greg Oddy is an ice hockey player who currently plays for the Adelaide Adrenaline. Jodie and Greg were married in Bali a few months ago, where Taylor was a bridesmaid. During her pregnancy, Jodie used her pregnant belly as a billboard to raise money for the Flinders Medical Centre’s Neonatal Unit and managed to raise over $25 000. Jodie is now on maternity leave. Jodie has revealed that Greg chose the name Payton, which he heard while playing hockey in Canada. Payton is #67 in Canada, and the more usual spelling Peyton is #34. Jodie seems to think the name is rare here, but there were 18 babies named Peyton born in South Australia last year, and it is #96 on the Top 100. She also revealed that her older daughter, Taylor, was named after Taylor from the TV soap opera, The Bold and the Beautiful. I’m a fan of ‘surnames as first names’ as you know ;), but I have to say these type I don’t like — ‘Taylor’ – ‘a tailor’, ‘Payton’ – ‘Paecc’s village’. Well, whoopy doo. Such names are very much ‘style’ over ‘substance’. That really doesn’t ring my bells :(. Not really my thing either, but it’s a very typical sibset, and there must be many sisterly pairings of Taylor and Payton/Peyton all over the world.